Pro Bowl voting ends Tuesday, and I'm prepared for another year in which popularity and reputation trump actual production and impact. The NFL Pro Bowl, like its inept twin, the NBA All-Star Game, has become "American Idol" -- minus the cranky Brit. Fan votes account for a third of the Pro Bowl selection process, with coaches' and players' ballots accounting for the rest. 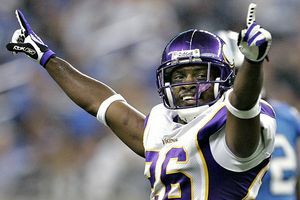 For players such as Vikings cornerback Antoine Winfield, who toil in a smaller market, Pro Bowl recognition can be difficult to attain. That doesn't sound like a harmful equation, but I'm advocating that the paying customers be left out. No disrespect. If you think the BCS is maddening, take a look at the current Pro Bowl voting. Kurt Warner should be the NFC's Pro Bowl starter, and rookie Matt Ryan his backup. Warner ranks second in the NFL in both passing yards and QB rating. The Cardinals have clinched their division and are in the playoffs for the first time in a decade. Meanwhile Ryan, whom I think also deserves MVP consideration, improbably rejuvenated a franchise that appeared dead a year ago. But according to the most recent Pro Bowl numbers, Warner was third in the voting and Ryan ranked fifth. Naturally, the fan support is strongly behind Eli Manning and Drew Brees, who have hogged the nationally televised games. Both are having solid seasons, but Warner and Ryan have been better. And speaking of New York, Brett Favre is the leading AFC vote-getter for quarterbacks -- even though Chad Pennington has outplayed Favre, and Kerry Collins has arguably meant more to his team than any quarterback in the NFL. Fans love football because it's a team sport, but when it comes to the Pro Bowl, they're suckered by the big names, no matter whether their performance justifies their selection or not. There have been several years when the best teams in the NFL have had very few Pro Bowl players. The Patriots and Eagles each had the best record in 2003, but just four Pro Bowl players between them. As long as the fans are a factor, NFL teams will blitz them with marketing campaigns that invite them to forget about making objective, common-sense picks. Just pick guys from your team. Case in point: The Redskins have 25 players sitting among the top 5 vote-getters at various positions. If fan voting were the only criteria that mattered, the Redskins would have 17 Pro Bowlers, making them the best last-place team in NFL history. Adrian Peterson and Michael Turner are 1-2 in the NFL in rushing, but Clinton Portis leads all running backs in Pro Bowl voting. Santana Moss ranks 15th in the NFL in receiving yards, but is second in the fan voting. Players and coaches aren't perfect, but if it were just left up to them there would at least be some semblance of order and the process couldn't be so easily hijacked. It also would make a Pro Bowl honor mean more. The flaw in the current system wouldn't be such a big deal if the Pro Bowl didn't matter so much. No doubt, the game itself has turned into a sham. There's no real tackling or blitzing. Guys put forth maybe 20 percent effort on a given play. When Barry Switzer coached the NFC in February 1995, he ate a hot dog on the sidelines. But a lot of players have financial incentives tied to Pro Bowl appearances, and that accolade is often used to determine how good a player or team might be. The most-repeated statistic about the Cowboys heading into this season was that they had an NFL-record 13 Pro Bowl players last season -- which only fueled the belief the Cowboys were the most talented team (on paper) in the NFC. Well, they aren't. The Giants had one Pro Bowl player and won the Super Bowl. Despite the politics, making the Pro Bowl means something to the players. It's a badge of honor. "If you're in a small market, no one really gets to see you play," said Antoine Winfield, a Pro Bowl-worthy cornerback who is third in tackles for the NFC North-leading Vikings. "If you're a quiet guy, it's hard to get the attention. You just have to work hard and play." I'm openly campaigning for Winfield because he's had a spectacular season. He has a pair of interceptions and has caused three fumbles. But unless the fans start mistaking him for Michael Phelps, this will be his 10th season without Pro Bowl recognition. "My oldest son said, 'Dad, why don't you get a signature dance?'" Winfield said. "But I'm not the one who is going to get up and dance." Not when some people seem so satisfied with the same old tune.